Port Welshpool to Five Mile Beach, 26.6km, 2hrs 22mins. After arriving at Port Welshpool, it took up to two hours to pack the gear which included food bags, camping gear and clothing into the kayaks. 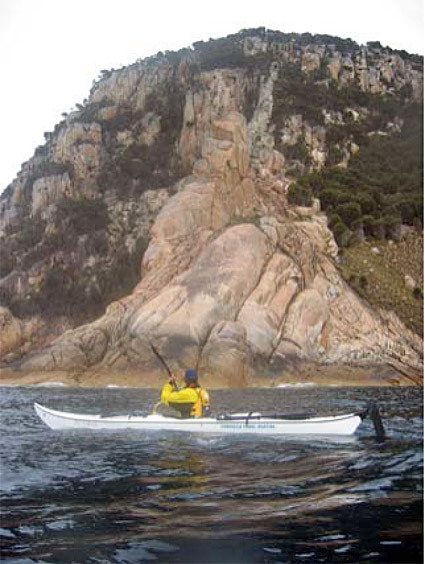 Having managed that feat, we said goodbye to support crew (Di & Anna) and set off down the coast of Wilsons Promontory. We passed pristine beaches with no visible footprints before arriving at Five Mile Beach and setting up our first night camp. Five Mile Beach to Refuge Cove, 18.9kms, 4hrs 14mins. 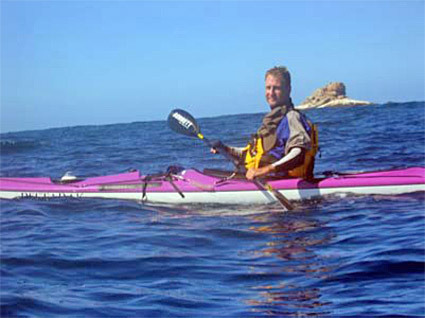 This was a short kayak hugging the coast and we were going almost regardless of the weather. But with wild winds whipping the water up into mini squalls it was challenging with only a brief reprieve stopping for lunch in Sealers’ Cove. We eventually kayaked into Refuge Cove and met up with Di and Anna who had walked in through the National Park. At this national park campsite we were able to talk at length with the Park Ranger (who turned out himself to be an accomplished kayaker), about weather and tidal conditions in the area. Refuge Cove to Hogan Island, 52.8kms, 8hrs 6mins. We left the mainland behind as we set off on our compass bearing heading towards the horizon with no sight of Hogan Island. A couple hours was spent kayaking into Bass Strait, with spirits high after finally starting the journey and regular visits from an albatross. Unbeknown to us, a storm warning had been issued after we had left the mainland and with still more than 20kms to go the wind and swell began to stand up. The group fanned out to survive the strong winds and breaking waves. Eventually we rounded the southern end of Hogan and pulled into a sheltered sandy beach. There we climbed to a small unmanned lighthouse atop the highest point of the island where we checked the weather reports from the radio and phoned in our successful crossing. Later we kayaked onto another beach in the bay next to a hut. We signed the hut log book following those brave kayakers that had gone before us. After a relaxing evening with a good dinner we retired to the tents for our first well deserved rest in Bass Strait. Not even the chanting of the penguins and the rat skirmish to pilfer our rice cakes broke the slumber. With 100km/hour gale force winds the crew quickly agreed to a day off the water. The island was semi-circumnavigated with the winds so strong it was hard to walk in a straight line. The swells pounded the island sending spray metres in the air. After catching up with the cricket on the radio at the lighthouse, the afternoon was spent spear and line fishing followed by filleting and cooking in the hut. After sunset we sat amongst the rocks in the dark and watched the penguins arrive on the island and make their way up to their burrows. As we left the sheltered bay of Hogan Island we had a clear view across to the Kent Group of islands over relatively calm seas in stark contrast to the previous day. We enjoyed kayaking the wide open sea before arriving off the entrance to Murray Passage only ten minutes off the targeted high tide. On arrival at Deal Island we were welcomed by a NSW Sea Kayak Club delegation with a sushi dinner, fresh water, good company, and even popcorn! We arose to an early morning yoga class overlooking Murray Passage. The highlight of the day was the inaugural Deal Island “Boat Ramp to Lighthouse Fun Run” with a member of our crew, Judd taking out line honours, Vincent Browning (a successful Bass Strait solo kayaker) coming in second and Jonathan third. We set out from Winter bay into unsettled water at a disheartening pace. Wright Rock raising from the ocean some 20kms away, refused to let us approach. When we eventually passed the rock, the flood tide had pushed us north, only to be brought back in the afternoon by the ebb tide. It had been a very long day at sea when we finally pulled into the sheltered beach on Roydon Island which is located close to Flinders Island. We took to the water at 2am and kayaked down the west coast of Flinders Island in the pitch black aiming to arrive at the town of Whitemark for the 7am opening of the bakery. We made it in after a couple of nudges with some jagged rocks doing minor damage to our kayaks and two snapped rudder cables. The bakery however did not open till 9am. The crew was responsible for the bakery’s largest day’s trading since, well, just the largest. That afternoon was spent repairing kayaks and cleaning gear at Di’s rented holiday house at Lady Barron before a hardy dinner at the Whitemark Interstate Hotel, a standard stopover on Bass Strait crossings. Then home to a real bed! Flinders island – Summiting Mt. Strezlecki. 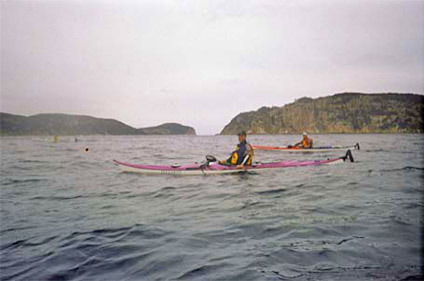 After a short kayak 15.9kms in the morning from Whitemark to Trousers Point to position the kayaks for launching the next day we headed off to climb Mount Strezlecki, the highest peak in Bass Strait at 756m. On summiting we where rewarded with stunning views across the dotted islands towards Tasmania. We set out across Franklin Sound for another long kayak. We had studied the tides, and even met with a local fisherman to discuss them, and found that our planning paid off with the tides shooting us down the SW coast of Cape Barren Island, past Preservation Island, and onto Clarke Island. At one point when stopped for a snack, the GPS reported us moving at 8km/hr. The titanic currents of Banks Strait were approaching. We set up camp on a long stretch of sand which we had all to ourselves and perched on a rocky outcropping looking across to the distant land form of Tasmania. our eyes rather than the GPS the crossing was uneventful and we pulled into Little Musselroe Bay full of pride and relief. We made it! To cheer us in was Di and Amanda and after loading up the cars we headed to Launceston for celebrations. For the trip we carried charts, (both marine and current) and marine GPS units (which had the trip way points loaded in) on our kayaks. We all had emergency EPRIB’s and had logged our trip course with the volunteer coast guard and Australian Marine Authority. We had done considerable preparation prior to departure with our kayak skills and kayaks as well as gaining as much knowledge as possible from trip reports of previous crossings. 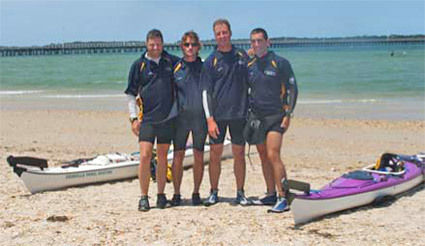 Total of 338kms and 49hrs kayaked across Bass Strait.